Grammar for the Well-Trained Mind takes students from basic definitions ("A noun is the name of a person, place, thing, or idea") through advanced sentence structure and analysis-all the grammar skills needed to write and speak with eloquence and confidence. Each year, parents and teachers go through the dialogue, rules, and examples in the Core Instructor Text; students follow along in a Workbook. This repetition solidifies the concepts, definitions, and examples in the student's mind. There are four Workbooks, one for each year. Each Workbook contains the same rules and examples-but four completely different sets of exercises and assignments, allowing students to develop a wide-ranging knowledge of how the rules and examples are put to use in writing. Each Workbook comes with its own Key, providing not only answers, but also explanations for the parent/instructor, and guidance as to when the answers might be ambiguous (as, in English, they often are). All of the rules covered, along with the repeated examples for each, are assembled for ongoing reference in the Comprehensive Handbook of Rules. This will become the student's indispensable guide to writing through high school, into college and beyond. The Core Instructor Text provides not only rules and examples, but scripted dialogue that makes it possible for any parent or teacher to use the program effectively, along with instructor notes that thoroughly explain ambiguities and difficulties. Scripted lessons make it possible for any parent or teacher to use the program effectively. Core Instructor Text is designed to be used effectively with students from fifth grade through high school, regardless of background. The program is easily customizable to each student's strengths and weaknesses. 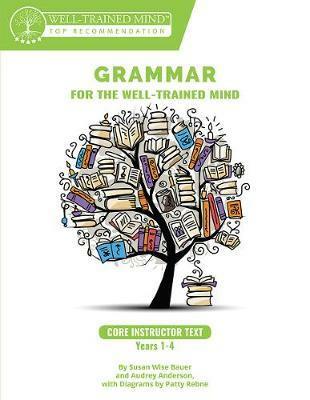 The Grammar for the Well-Trained Mind series provides all the grammar skills needed to write and speak with eloquence and confidence. The Core Instructor Text supplies a full course of lessons--and can be used in each of the four workbooks in the program. - Scripted lessons make it possible for any parent or teacher to use the program effectively. - Step-by-step instruction takes students from the most basic concepts through advanced grammatical concepts. - Extensive diagramming exercises reinforce the rules and help technical and visual learners to understand and use the English language effectively. All diagrams are thoroughly explained! - Text for examples and exercises are drawn from great works of literature, as well as from well-written nonfiction texts in science, mathematics, and the social sciences. - Regular review is built into each year of work. Combine this Core Instructor Text with a Workbook and corresponding Key set for a full year of powerful learning! Add the Comprehensive Handbook of Rules, and your student will have an indispensable guide to clear, grammatical writing that will last into college--and even beyond. Susan Wise Bauer is a writer, educator, and historian. Her previous books include the Writing With Ease, Writing With Skill, and Story of the World series from Well-Trained Mind Press, as well as The Well-Trained Mind: A Guide to Classical Education at Home, The Well-Educated Mind: A Guide to the Classical Education You Never Had, Rethinking School, The Story of Western Science: From the Writings of Aristotle to the Big Bang Theory, and the History of the World series, all from W. W. W. Norton. She has a Ph.D. in American Studies from the College of William & Mary in Virginia, as well as an M.A. in seventeenth-century literature and a Master of Divinity in Ancient Near Eastern Languages and Literature. For fifteen years, she taught literature and composition at the College of William and Mary. Audrey Anderson is an international development professional specializing in programming for women and girls. Her background includes program design, strategy, management and evaluation, with field experience in gender-focused programming and education in Latin America, Africa and Asia. In addition to Audrey's work with the Well-Trained Mind, she has contributed to the development of curricula for life skills programs for adolescent girls around the world. Audrey holds a bachelor's degree from the College of William & Mary, and a master's in International Education and Development from George Washington University. Patty grew up in Colorado, where she earned a BA and an MBA. Most of her grammar, she learned from her mother, an award-winning journalist. To earn a living, Patty taught high school, delivered packages for UPS, marketed and sold software as a Senior Product Marketing Manager at Microsoft, inscribed Christmas cards, and wrote fortune-cookie fortunes. She and her husband Glenn live near Seattle; they have a grown son who was mostly homeschooled, guided by The Well Trained Mind with generous additions of ski days and road-trips. Patty likes the physical action of handwriting, and does photography and cross stitch in her ample spare time. Aaron Woodard is a Virginia based Designer & Illustrator with experience ranging from small start up companies to larger corporate projects. He received a Bachelor's in Communication Arts (Illustration) from Virginia Commonwealth University and an Associates Degree in Graphic Design from Virginia Western Community College.